Kikuyu (Pennisetum clandestinum Hochst. ex Chiov) is a tropical grass from Eastern Africa that has been introduced in other tropical and subtropical areas. It is palatable, resistant to heavy grazing and mostly used for pasture. Kikuyu is a vigorous, prostrate, rhizomatous and stoloniferous perennial that spreads readily and forms dense swards (Ecocrop, 2010; Clayton et al., 2006; Mears, 1992). Kikuyu has a deep root system, down to 3 m. The root system is denser within the upper 15 cm of soil. 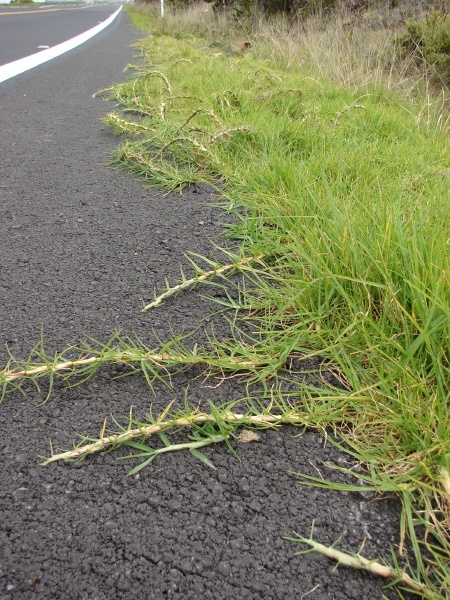 The runners (stolons) are up to 40 cm long and are profusely branched. The short culms (8-15 cm) arise from the nodes of the stolons. The leaves are blade-shaped, 15 cm long x 5 mm broad, tightly folded when young, flattened when older (Mears, 1992). The inflorescence is a spike, bearing 2-4 spikelets that are enclosed within the upper sheath. The caryopsis is 2-2.5 mm x 1.5 mm (FAO, 2010; Cook et al., 2005; Mears, 1992). Kikuyu is palatable to cattle, providing permanent pasture for grazing, hay or silage. It responds well to irrigation (Ecocrop, 2010; FAO, 2010; Mears, 1992; Göhl, 1982). It is also used in erosion control and as ornamental turf (Cook et al., 2005). Kikuyu originated from the elevated plateaux of tropical Eastern Africa, from the area where the Kikuyu tribe lives. It has then been widely introduced to tropical and subtropical areas between 35°N and 37°S (GISD, 2010). It is now widespread in tropical and subtropical areas at elevations between sea level and an altitude of 3500 m, though it is restricted to elevations above 1900 m in South-East Asia. It thrives in well-drained, deep red, latosolic soils at the forest margins and in grassy glades (Ecocrop, 2010). Optimal growth conditions are average day temperatures ranging from 16 and 21°C, as high or low (less than 7°C) temperatures hinder its growth (Cook et al., 2005). Annual rainfall should be between 800 mm to 3000 mm, provided that the soil is well drained (GISD, 2010) and the rainfall is evenly distributed throughout the year (Göhl, 1982). Kikuyu likes fertile loamy soils or clays, especially well-structured, red basalt soils, but will also grow on alluvial and moist sandy soils with adequate fertilizer levels (Cook et al., 2005). Kikuyu is tolerant of low soil pH and high Al and Mn content, and it is also tolerant of salinity (Mears, 1992). Kikuyu responds positively to irrigation and its water use is enhanced by adequate N levels (Cook et al., 2005; Partridge, 2003). Thanks to its deep root, kikuyu is moderately drought-resistant (Ecocrop, 2010; Göhl, 1982). Kikuyu can survive flooding, fire and frost down to -9°C (Ecocrop, 2010; Cook et al., 2005). It is poorly tolerant of shade (FAO, 2010). Yield ranges between 9 and 30 t DM/ha depending on adequate N being available. Kikuyu’s response to fertilizer is very good (Mears, 1992). In extreme conditions of drought (33% less water than optimal irrigation), kikuyu yielded 17 t DM/ha/year, significantly higher than 15 other perennial forage species (Neal et al., 2009). Kikuyu is a grass tolerant to salinity up to 100 mM, suggesting its possible utilization in saline land where the survival of other fodder species is markedly reduced (Muscolo et al., 2004). To provide forage throughout the Mediterranean summer when there are high temperatures and low rainfall and when cool-season grasses become less productive, Pennisetum clandestinum provided the best combination of agronomic and yield characteristics, which were similar to those of alfalfa (Medicago sativa), when compared to seven other grasses (Gherbin et al., 2007). Kikuyu is very resistant to constant heavy grazing and trampling provided fertilizer levels are maintained (Cook et al., 2005; Fukumoto et al., 2003). It should be grazed to a height of 5 cm and allowed to regrow to 15 cm to preserve forage quality and palatability (FAO, 2010). 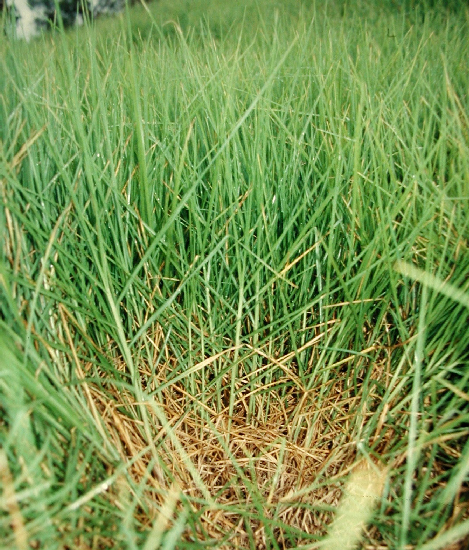 Kikuyu is mostly found in mono-specific pastures since it competes aggressively with other grass species. However, it can be sown with legumes such as Vigna parkeri, Arachis pintoi, Trifolium repens, Trifolium burchellianum, Trifolium semipilosum, Desmodium intortum and Neonotonia wightii provided that kikuyu is grazed sufficiently to let the legumes grow (Cook et al., 2005). In mixed pastures, grazing at a height of 10-15 cm should be allowed every 6-8 weeks (FAO, 2010; Fukumoto et al., 2003). Under heavy fertilizer applications kikuyu can sustain stocking rates of 1.5-3 head/ha (Mears, 1992). However, stocking rates should be low until the runners are growing vigorously and all bare soil is covered (Göhl, 1982). Kikuyu grows quickly, and spreads readily thanks to its stolons and rhizomes forming a dense sod that requires minimal management. It is therefore used to control erosion in irrigation channel banks, especially near regulators and water wheels, on river banks, degraded catchments and steep cultivated lands (Mears, 1992; FAO, 2010). Because of its vigorous growth and strong competition with grasses and legumes, kikuyu may become a harmful weed in well-fertilized soils (Ecocrop, 2010; FAO, 2010). It is often a weed in arable land or irrigation channels, and intensive control by hand or with herbicides is necessary (Mears, 1992). It is declared a noxious weed in several states of the USA and in some regions of Australia (USDA, 2010; Cook et al., 2005). 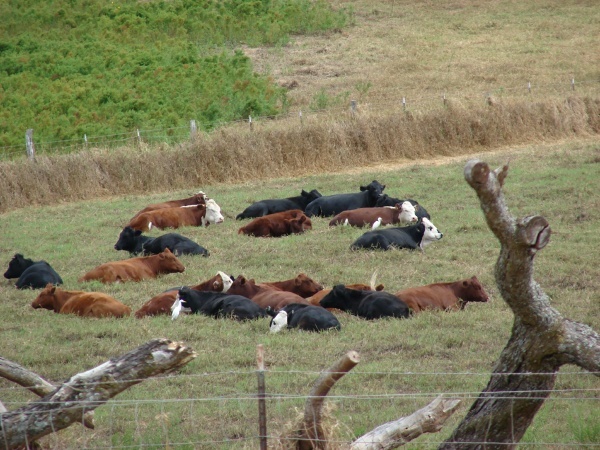 Sporadic cases of kikuyu grass poisoning occur seasonally, but it remains unclear if the poisoning is caused directly by the grass, or in response to the presence of a pathogen, or directly by a pathogen. Several classes of plant toxins and mycotoxins can cause inflammation of the gastrointestinal mucosa and it is one of these, such as glycoproteins, triterpenoid saponins, glycosidic alkaloids, macrocyclic trichothecenes, and viridin-like furanosteroids, that could be the actual cause of toxicity (Bourke, 2007). 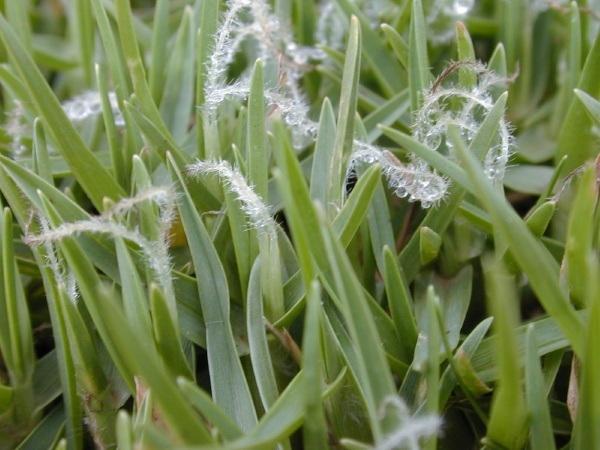 Specific conditions appear to favour kikuyu poisoning, such as hot dry weather followed by rain and rapid grass regrowth. 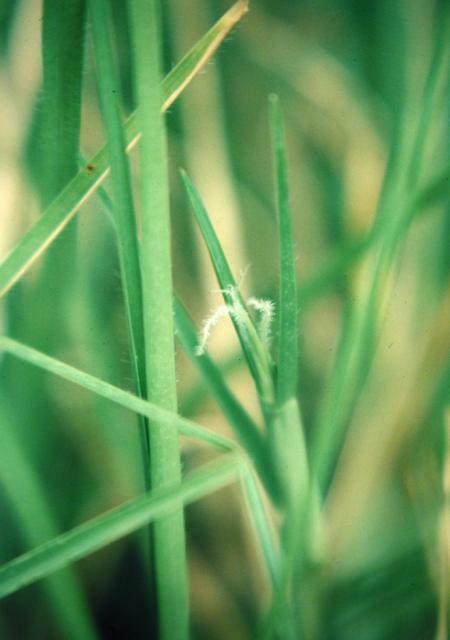 Infestations of armyworm caterpillars may also be involved. The majority of clinical signs of poisoning recorded have been consistent between outbreaks: ataxia, recumbency, loss of rumen motility, abdominal distension and excessive salivation. Histological analysis reveals severe damage to the mucosa of the rumen, and rumen epithelium necrosis in the omasum (Marais, 2001; Barnes et al., 2007; Bourke, 2007). Kikuyu accumulates oxalic acid but not in amounts high enough to result in acute toxicity in cattle (3.9-24.4 g/kg DM < 69 g/kg). Ruminants readily adapt to oxalates due to a rumen bacterium, Oxalobacter formigenes, that converts oxalates to formate and carbon dioxide. However, as it binds with Ca, oxalic acid can result in hypocalcaemia in herbivores. Horses suffer from hyperparathyroidism (big head disease) and cattle may suffer from low calcium availability, resulting in possible low fertility and milk fever in dairy cows (Marais, 2001). Lush growth associated with excessive applications of nitrogen can cause nitrate poisoning (Cook et al., 2005). Nitrates are non-toxic but their transformation into ammonia, within the rumen, produces toxic nitrites that bind with haemoglobin and prevent blood from binding with oxygen, resulting in oxygen starvation of the tissues and animal death in the most severe cases (Marais, 2001). Energy is a major nutritional limitation of kikuyu due to its high cell wall content and to a low digestibility of structural components. The deficiency of non-structural carbohydrates is likely to be aggravated by diurnal fluctuation in the plant (Marais et al., 1990). The concentration of metabolizable energy is low, 8.5 MJ/kg DM, as calculated from an OM digestibility of 65% (Marais, 2001). Recorded OM digestibility varies between 47 and 73%, depending on the stage of regrowth (Feedipedia, 2010). Due to the large difference between leaf and stem tissue, the nutritive value appears to be optimized at the 4.5 leaves per tiller growth stage (Marais, 2001). Crude protein varies from 8.5 to 25.6% DM (Murtagh, 1990) and is higher than that of other tropical grasses. However, the high nitrogen levels in kikuyu induce a poor protein metabolism and low animal productivity (Marais et al., 1990; Hanna et al., 2004; Carvalho et al., 2010). A high concentration of nitrogen in young kikuyu regrowth may result in high rumen ammonia, which is largely lost as urea via the urine. The NDF content ranges from 58.1 to 74.1% DM and resembles temperate species in having relatively low NDF, but digestibility is similar to those of other tropical species (Marais, 2001). There is a negative correlation between cell wall content (NDF) and digestibility (Moore et al., 1972; Feedipedia, 2010). Kikuyu appears not to contain condensed tannins which could reduce ammonia formation in the rumen (Jackson et al., 1996; Marais, 2001). Lignin content in kikuyu can be as high as 6% DM in rich stems at the end of the season (Marais, 2001). Animal production on kikuyu should be improved by an energy supplement. Poor absorption of Ca and Na by kikuyu also makes supplementation essential for these two minerals for optimal animal production on kikuyu pasture (Marais, 2001). For grazing dairy cows, kikuyu, despite not being available in winter, was one of the most preferred grasses, after prairie grass (Bromus wildenowii), among 14 other grasses and legumes, including white clover, in 8 seasons over 2 years (Horadagoda et al., 2009). The relative palatability can be reasonably predicted by the water soluble carbohydrates and nitrate-nitrogen contents (Soto et al., 1980; Dugmore et al., 1991; Marais, 2001). 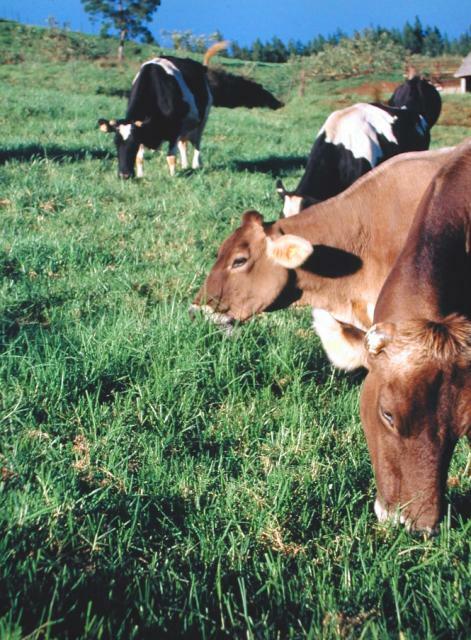 Due to its high DM yield, kikuyu pasture supplemented with energy has been used for dairy cattle in many countries. In Friesian cows, milk production was restricted to 13-16 L/d even on well-managed kikuyu pasture (Reeves et al., 1996; Marais, 2001; Hamilton et al., 1992; Carvalho et al., 2010). The low milk protein content (less than 3.0%) indicates low efficiency of nitrogen utilization (average 17.4%) for the synthesis of milk proteins. The high milk content of conjugated linoleic acid (20.0 mg/g lipids) showed the high linoleic and linolenic acid content of kikuyu (Correa et al., 2008). The supplementation of dairy cows grazing rotationally kikuyu with high energy concentrates is sufficient for mid and late lactation, without requiring protein supplementation. Milk production may reach an average of 15.7 kg/cow/day (Semmelmann et al., 2008). The average potential milk production from cows grazing Kikuyu was restricted at 12 L/cow/day, even though the potential of this forage was 29 L/cow/d given its energy content (Correa et al., 2008). With levels of supplementation between 20 to 100% of requirements for milk production, a linear increase in milk yield of grazing cows was up to 24 kg of milk/day (Carvalho et al., 2010). In a survey of 229 dairy farms in Colombia, 33% of the farms had cows producing 16 to 20 L/day (Osorio, 2004). The milk yield of Jersey cows grazing kikuyu pasture in late summer and receiving a maize-based supplement (6 kg/d), or a maize/fishmeal supplement (8% fishmeal in an iso-energetic diet) increased with the level of fishmeal fed until 19.5 kg/day (Malleson et al., 2009). The total milk production may be increased when kikuyu is over-sown with annual ryegrass (from 3.9 T milk/ha to 8.1 T milk/ha) or white clover (7.3 T milk/ha). But the mean annual grazing capacity has to be considered to evaluate the effective gain in milk production per hectare. Indeed, the milk produced may vary between seasons, being higher during spring and summer (15 kg/d and 14.4 kg/d) than during autumn (12.1 kg/d) (Botha et al., 2008). By adjusting the loading or the ratio of days grazed per day rested and taking into account the grazing period, it was possible to improve the carcass weight of heifers grazing on an irrigated kikuyu/white clover pasture (Clatworthy et al., 1980). There are conflicting results about the performance of sheep grazing kikuyu forage, due to differences in the quality of herbage as influenced by the rest period and leaf proportion (Rethman et al., 1973; Barnes et al., 1993). The potential of kikuyu forage to meet the requirements of dry ewes without supplementation appears limited: grazing ewes lost weight, varying from 4.7 to 10.3% of the initial body weight during the 8-week grazing periods over four seasons (de Villiers et al., 2002). The combination of kikuyu pastures with trees belts of Tasmanian blue gum (Eucalyptus globulus) led to significant increases in the clean wool production of Merino sheep (75 kg/ha) compared to kikuyu alone. Kikuyu is tolerant of shade and interacts positively with trees for soil nutrients and periodic water stress. This combination allows for substantial reductions in groundwater recharge from irrigation (Sanford et al., 2003). Increasing the length of the regrowth period of kikuyu from 50 to 90 days, before making hay, reduced its feeding value for lambs due to a lower OM intake, but did not affect digestibility. Hay intake appeared to be mostly limited by its content of structural carbohydrates (Chiesa et al., 2008). In another experiment, between days 39 to 78, voluntary intake of penned sheep increased with herbage maturity, with the highest values at 50 and 78 days of regrowth (66.86 and 70.64 g/kg W0.75/day respectively). Dry matter intake increased due to changes in DM digestibility and fibre contents. Voluntary intake and DM digestibility are negatively correlated with ADF, lignin and Si contents. These parameters are positively correlated with leaf:stem ratio (Soto et al., 1980). The use of tree leaves can help to improve the nutritive value of kikuyu hay. In Chiapas (Mexico), the leaves of Buddleja skutchii, a common multipurpose fodder tree have been substituted for 50 or 100% of kikuyu hay without decreasing DM intake and digestibility (Camacho et al., 1999). However, a later experiment found that the inclusion of Buddleja leaves maintained daily weight gain as well as wool and manure production, but it decreased DMI and digestibility resulting in lower economic benefits than with kikuyu grass alone (Nahed et al., 2003). Broiler rabbits can be reared satisfactorily on a low grain concentrate (containing 20% maize grain and up to 64% wheat bran) supplemented with ad libitum green kikuyu grass (Singh et al., 1997). Kikuyu pasture and hay is a common forage for horses in countries such as South Africa and Australia. In South Africa, observed DM intakes were 8.3 and 4.7 kg/day for fresh forage and hay respectively. DM digestibility for fresh kikuyu and hay was 54 and 34% respectively (Stevens et al., 2002). 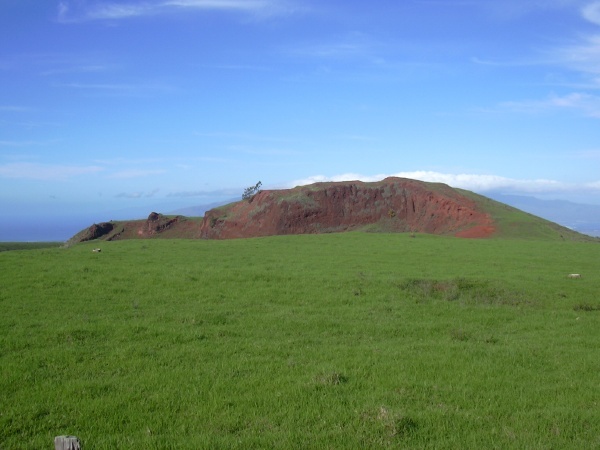 In Australia, subtropical pastures containing kikuyu, Paspalum plicatum and the legumes Lotononis bainesii and Trifolium repens supported adequate DE intakes in all classes of mares, except for lactating animals during the late spring and early summer periods. Live weight losses were recorded in these animals at this time but this did not appear to influence the mares' reproductive activity or foal growth rate. This indicated that protein and energy supplementation are not usually necessary (McMeniman et al., 1990). Hanna, W. W. ; Chaparro, C. ; Mathews, B. ; Burns, J. C. ; Sollenberger, L. E. ; Carpenter, J. R., 2004. Perennial Pennisetums. In: Moser, L.E. ; Byron, L.B. ; Sollenberger, L.E. (Eds.) Warm-season (C4) grasses. Madison: ASA/CSSA/ SSSA, 2004. p.503-535.